Former Florida State football coach Bobby Bowden’s grandson was one of two men killed when their car flipped into a small ditch off a central Florida road, officials said Thursday. Taylor Jeffrey Bowden, 23, and driver Rafael Fernandes De Aguiar Valim, 25, both died in the crash, according to a news release from the Polk County Sheriff’s Office. Spokeswoman Carrie Eleazer confirmed Bowden’s relation to the famous football coach. 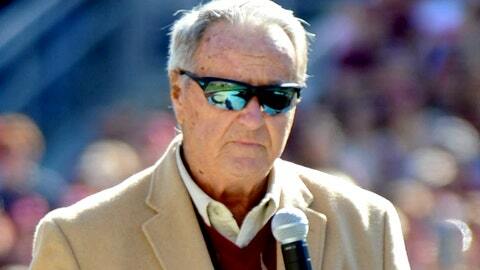 He is the second grandson that Bobby Bowden has lost in a car crash. Bowden Madden, 15, and Bobby Bowden’s former son-in-law, John Allen Madden, were killed in September 2004, when their car was hit a by a utility truck that was helping to restore power outages caused by Hurricane Frances. A third man in Thursday’s crash in Winter Haven — 22-year-old Robert Lewis Edwards — was rescued after spending hours in water up to his neck. Bobby Bowden led the Seminoles from 1976 to 2009 when he retired. The 84-year-old holds the NCAA record for most career wins and bowl wins by a Division I coach and won two national championships.